Determining the intrinsic stock value of a company is decidedly one of the most difficult things in trading. Even experienced traders have problems with certain valuation metrics. Despite the difficulties encountered, being able to tell if a certain stock is valuable for trading or not is crucial to the entire process and business. The dividend growth model is one of the many used in establishing a stock’s value. Here are the basics involved in this type of calculations as well as some pointers for future reference, should you desire to delve into this yourself. As many in the industry have pointed out, the stock prices that you get after using formulas such as the dividend growth model are variable. This is why it’s difficult to use figures as precise buy or sell prices. Nonetheless, there are advantages one can obtain from calculating stock values yourself. First of all, it allows you, the investor, to put a certain price on a stock that can be then used as a gauge. But, more importantly, going through this process on your own will allow you an almost intimate peek at the way in which stocks are priced. You will see there are special characteristics involved, such as growth, as well as fundamental elements, like income. You will then be able to see first-hand how these metrics affect the prices and decide what it is you can do about it. This notion represents a company’s fair underlying or ‘intrinsic’ value. It’s usually determined after fundamental analysis has been performed. The reason why it’s so important can easily be deduced by simply looking at Warren Buffet. The businessman has managed to become the biggest investor of all time because he has always been able to pick stocks with a higher intrinsic value than that of their current market value. Intrinsic value is most of the times calculated by discounting a batch of future cash flows or some income thought to be generated by a certain company or a stock until it goes back to its present value. Simply put, present value is actually the current value or how much future cash flows are worth. Let’s look at an example: $10 today is clearly worth more than $10 ten years from now, because the value of money is influenced by the passing of time. The main “culprit” is inflation, which chips away at the ability of buying different things for the same price over time. This is the exact reason why all investors prefer to receive money now than wait for an undetermined period of time and then receive an uncertain sum of money. The risk is that they will not be compensated in an adequate fashion. The dividend discount metric uses dividends or any income to create an intrinsic value. As mentioned, its formula takes the future flow of a company’s dividends and discounts them back to the value they currently have. There are quite a lot of variations on the discount model, but this article focuses on the dividend growth model to calculate stock intrinsic value. The reason is because it’s one of the easier ways to calculate it on your own. You need to keep in mind that you have to use decimals instead of percentages, otherwise this model will not work. *the risk free rate = the yield on long-term Treasuries, like a 30-year Treasury bond. The idea behind using a bond that is long-term is that equities are considered indefinite holdings. This is why the risk-free rate should be a very long-term risk-free rate. * the market risk premium = the expected return of the stock market, extracting the risk-free rate. Simply put, it’s actually the return used as a hook to make investors buy risky assets instead of the risk-free ones. A very important thing to mention here is the fact that quite a few economists believe our stock market will never achieve the same type of returns that we have seen so far on the long run. But, this particular opinion is difficult to be grounded on real arguments. This is why using a long-term historical market risk premium is thought to be a good-enough solution. *beta = a measure of a stock’s volatility dependent on the market. If a beta is 1.0, that means the stock is just as unpredictable as the market is. Stocks that come with a beta higher than 1.0 are more unpredictable than the market itself, while stocks with betas lower than 1.0 are steadier than the market. As an example, Microsoft is considered to have a beta of 0.97. It’s important to keep in mind that the constant growth model does have a few shortcomings. The market, as previously mentioned, is volatile by default, which means that all these calculations, although made using a formula, cannot benefit from a mathematical soundproof result. The other metric based on the growth model is the multi-stage formula. It’s an alternative to the constant one and it’s much more complicated. The reason is that it has fewer constants and a lot more required estimates. Despite this situation, it can anticipate future changes as far as growth rates are concerned. The calculation in itself asks the user to add the dividends’ day value paid during the high-growth period to the present value of the company’s terminal value. *the terminal value of a company = the value of the stock at the beginning of the stable growth period of time. Instead of making predictions and dividend forecasts for the future, the terminal value states the situation of the rates at a certain point in time when the dividends are expected to be stable in their growing. The idea is that making predictions about dividend after a particular point in time is, indeed, impractical. Apart from that, future dividends are usually discounted so much that they cannot significantly change a stock’s valuation anymore. Choosing between the two formulas detailed here is a tricky task. The reason is that they yield different results. Apart from that, the user might be unsure of the results because the market shifts so much. It’s good to keep in mind that we are talking about big companies, as mentioned in the beginning, that change a lot over the course of just a few years. Depending on their line of business, they might launch new products, acquire smaller companies, sell part of their lines or merge with other entities. All these actions lead to significant changes which will render the results obtained via the two models moot. However, the constant growth formula is generally believed to be the better of the two as far as mature and stable companies go. This basically means that, if the company is well-established and passed its growing stages, the constant formula is better. If you are trying to value stocks belonging to a company that is still in its early stages or developing rapidly, you should go with the multi-stage model. 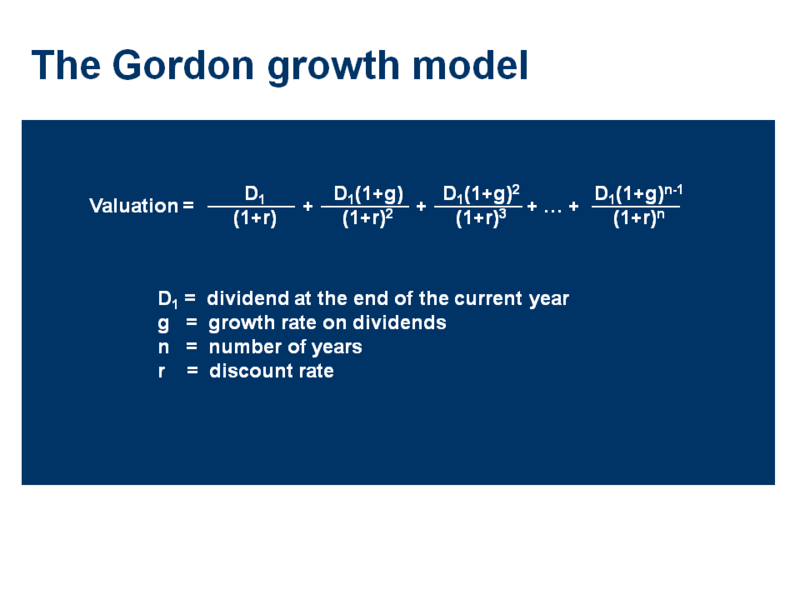 The divided discount model is also known as The Gordon Growth Model. It was thusly named in the 60s after professor Myron J. Gordon. However, the professor was not the only financial analyst to swear by this model. Robert F. Weise and John Burr Williams rendered great results in this field as well, via the work they did in the 30s. 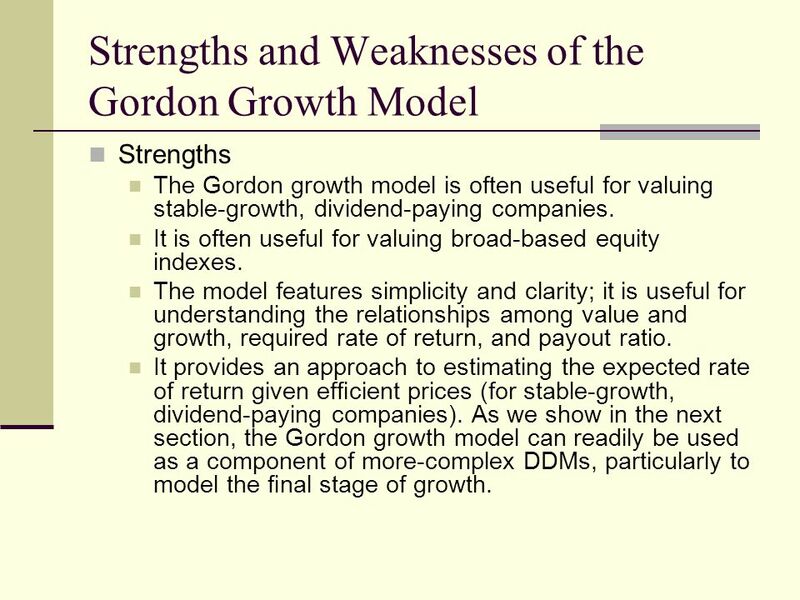 Under the Gordon model, a stock is considered by definition more valuable when its dividend increases, the investor’s rate of return decreases or when there is an increase in the expected dividend growth rate. At the same time, the model implies a stock prices needs to grow at the same rate as the dividends do.